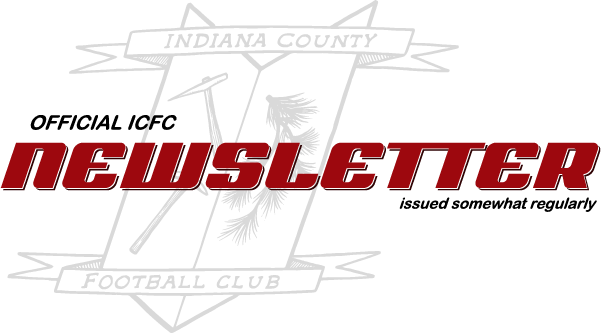 Welcome to the January 2019 edition to the ICFC Newsletter. We hope your ambition for the new year is to play more soccer. This month’s newsletter will include a look back on some of the programming we concluded in December and will also keep you informed on the current month’s happenings. In addition, we’ve included a sponsor of the month and member of the month section. Ben and Kris Bruns, first through Brunzies Bar & Grille in 2016 and then additionally through Subs n’ Suds, were the first to sponsor a team in one of ICFC’s leagues, and it was based on that support that we were able to launch our club’s sponsorship program in 2018-19. Brunzies and Subs n’ Suds each support a team in all three of our leagues and comprise one of our top tier sponsors for the year. Without the first sponsor, the program at large may have never happened. Special thanks to Ben and Kris Bruns! 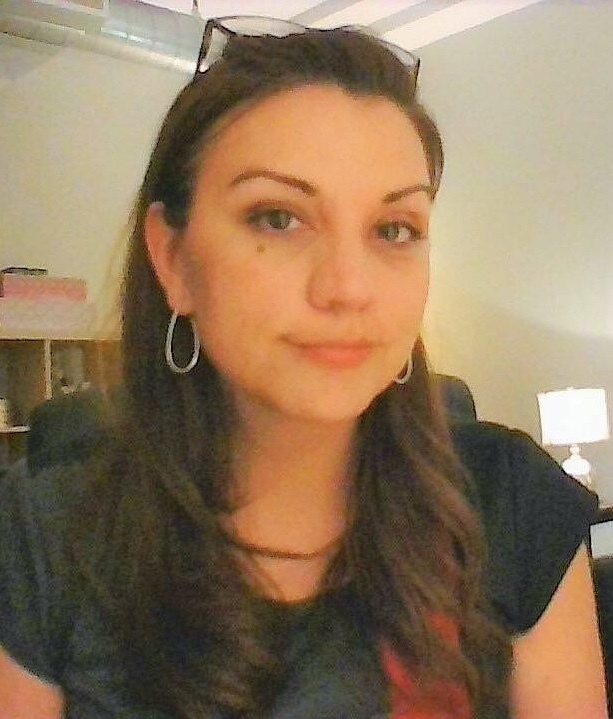 Jennifer has been with ICFC since its first days and plans to play for a long time. She says, “Lord willing, I hope to stay and be the female version of Vinny.” She has been integral in getting ICFC’s “Ladies Night” women’s only pick-up futsal program (see below for details) up and running. Jennifer says, “There really isn’t a word to describe what it is like to be back on the field with a group of just women…there is a different kind of let-your-hair-down bond… a lot of the women have careers and/or children, just a lot on their plate, so it is nice to see everyone laughing.” Jennifer appreciates the growing social aspect of ICFC overall, as well as the fact that “it is a community and a safe one to be an ok player that has more heart for the game than skill.” When she’s not playing soccer, Jennifer is a licensed professional counselor; she runs her own practice, Jennifer Van Wieren, LPC, in Indiana, where she works with ages 5+ with different diagnoses, including anxiety issues, and also does couples and family counseling. Jennifer and her husband Todd have been married for 23 years and have four children. She enjoys running and other outdoor activities. 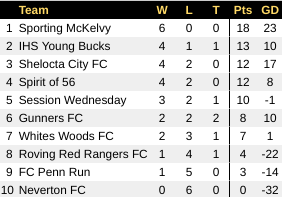 Sporting McKelvy could be cruising comfortably to their first ever futsal hardware, as the winner of the round robin league table takes home the Community Cup. Divisions in the league for the second round of group play will be divided between the 5th and 6th positions. Gunners at 6th with a +10 goal differential indicates they may make a late season push due to their strength of schedule. The EXCITEMENT! Das Boot Award: Carly Baird — The member who is most fun to be around post-match. Most Improved Female Player: Amy Jeffords — The member who has most improved her gameplay throughout the course of the year. Most Improved Male Player: Chris Jeffords — The member who has most improved his gameplay throughout the course of the year. Ballon D’or Le Femine: Courtney Scherf — The female member who was the most valuable asset to her squads throughout the course of the year. Ballon D’or: Jose Soriano — The male member who was the most valuable asset to his squads throughout the course of the year. Member of the Year: Nate Wygonik — The member who has displayed premier devotion to ICFC. The fourth official running of the ICFC 3v3 tournament provided a nice four-hour run in the midst of holiday chaos. The tournament hosted seven teams totalling 32 players. The pairings provided a seven-team round-robin format with a breakout of the top four teams playing a knockout round and the bottom 3 squads playing an aggregated round-robin to determine two cup winners. In the end “Newcastle,” comprised of Joe Cronan, Graham Hunter, Steve Kowalski, and Dustin Fleming, won the Group A cup. They compiled 21 total points of the 24 available on the day. Group B was claimed by “Not Neverton,” comprised of Dan Lee, Josh Webster, Jason Fesler, Matt Daymut, and Jeff Mazey. However the real winners of the tournament was “Levity Brewing,” whose players — Carly Baird, Jen Fesler, and Nathan Peppler — played the entire day without any subs but nevertheless pushed themselves into the Group B finals, where the ultimately gave way to “Not Neverton” on a golden goal. They may have not won a Cup, but they won our hearts. In the final full-field run of the 2018, 18 players — some regular club members, some family of club members, some former club members who were home for the holidays — battled to an intense 10-10 draw. It was then determined (by James) that there MUST be a winner, and team Thompson prevailed 11-10. If you weren’t there… you totally missed it. Saturday, January 19th, 7 PM at Disobedient Spirits: The second show of our Concert Series features the Lo-Fi Rock & Roll capabilities of Weird Paul Petrosky. 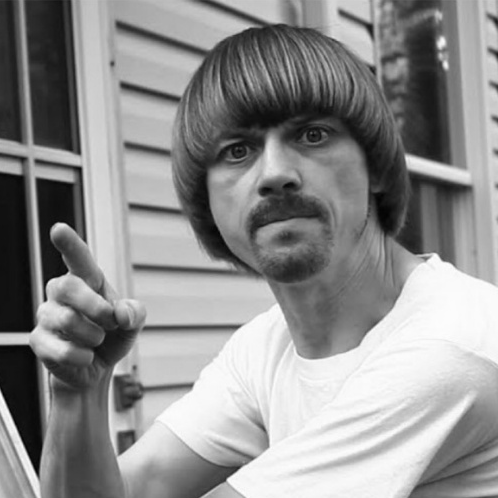 You do NOT went to miss this Pittsburgh-based music phenomenon. Tickets are $10.00 in advance or $12.00 at the door. Also, if you buy 4 tickets online a week in advance of the show, you’ll get a 5th ticket free (this is a great deal only if you actually have 4 other friends. Prove to us that you do). Please consider attending this event, which may be the best-kept secret in Indiana County. Sunday, January 27th, 10 AM on the S&T Arena turf: This year we are starting our youth 3v3 tournament. To put on a best-in-class tournament, we need your help. Volunteer sign-ups will be available for timekeepers, referees, and bracket coordinators. If you’re available, please contact us to offer your help. Details: $50.00 per team, capped at 16 teams, deadline for registration is 11:59 PM on Friday, January 25th. Women’s-Only Pickup: Every Tuesday, 8-9 pm, until January 23, 2019 (at which time the date and time will be adjusted). Sessions include skills and drills led by experienced coaches followed by gameplay. No previous experience necessary. $10.00/player per session.